The Tucson Weekly has afforded me this opportunity to post on The Range about the missing RTA poll tapes. What are poll tapes and why do they matter? Poll tapes are receipts that are printed in each precinct at the end of the election night. They contain the vote totals that indicate the results for that particular precinct. Once printed, election workers verify the authenticity of the poll tape and its totals by signing the bottom of each poll tape. For this reason, poll tapes could serve an important auditing function, especially in conjunction with examining the ballots. Out of 368 memory cards representing 409 precincts, there are 112 poll tapes missing, which represent 122 precincts. This is approximately 30 percent of the precincts counted. 102 additional supporting documents (yellow sheets) are missing. 50 of the polltapes that were found do not match the final canvas. Why is this significant? Because it utterly discredits Attorney General Terry Goddard's investigation, it renders the RTA investigation incomplete and it underscores the lack of confidence in Pima County's elections. 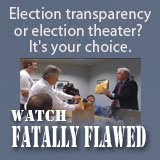 Attorney General Terry Goddard contradicted himself numerous times over activities involving the RTA poll tapes. Bill Risner said that prior to Goddard swooping in to take the ballots out of Pima County last year in advance of the hand-count, he had explained to him the significance of reviewing the poll tapes. "We told the attorney general's office that if we look at the poll tape, there would be clues on it that would tell us whether they had used the machines to fraudulently program [the election]. ...That's when he grabbed the ballots." A quick look at the timeline of events supports Risner's claim. In an article dated Feb. 13, 2008, Terry Goddard told the Arizona Daily Star that he didn’t intend to examine the ballots. Five days later, Bill Risner informed Goddard that the Democratic Party will examine the poll tapes. Then eight days later, Goddard’s staff is in court announcing their “secret court order” to take the ballots and poll tapes as part of a criminal investigation. During the course of this investigation by Goddard's staff, the Democratic Party repeatedly requested that Terry Goddard examine the poll tapes, because they would provide a valuable “precinct snapshot”. In addition, they can easily be identified as fake or regenerated, and so would have evidentiary value. Election integrity activists and the Democratic party were assured by the AG's office that Terry Goddard's investigation would include examination of the poll tapes. This was not done. Contradicting himself again, Terry Goddard reveals in his press conference following the hand count that he had not examined the poll tapes and saw no value in examining them. At the time of the press conference, Terry Goddard knew of the significance of the poll tapes. His statement "Why would we count a poll tape? I mean, I don't see how they are relevant to the hand-count." is either disingenuous or a flat-out lie. Once Goddard finished his hand-count debut with the RTA ballots, he packed them up with the poll tapes and passed them back to the Iron Mountain Storage facility in the custody of Treasurer Beth Ford. This move saddled the Democratic party with another year of litigation, seeking access to the poll tapes, which is why the missing poll tapes are being reported one year later. What is known is that the ballots and poll tapes had been stored at various times at unknown locations in Maricopa County, Maricopa Elections Division and the Iron Mountain storage facility. Testimony in the most recent poll tape litigation established that Iron Mountain was not a secure facility when it came to the RTA ballot boxes. Despite evidence at trial that the County Manager had instructed the County Attorney to tell Iron Mountain that no one could approach those boxes, the Iron Mountain representative stated under oath that "no one ever told us that, and our customers, the county, could always come in to these boxes." The fact that the County had access to those poll tapes at the Iron Mountain facility at all times makes forensic analysis of the ballots imperative. After all, anyone from the County could apparently have been granted access to those ballot boxes. Yet, during the press conference, when questioned by Jim March, Goddard said he had no cause to perform the nondestructive no-cost forensic examination of the ballots. Shortly after the press conference, Terry Goddard was a guest on the John C. Scott radio show reiterating once again his contention that the hand count established that the RTA election results were proper and there was no need for further probing. I called in to the show and asked Terry Goddard if he was aware of the problems with custody of the hard drives that were in the Pima County Vault. I was referring to the Sept. 14, 2008 discovery that despite a court order for release of unaltered election data to the Pima County Democratic Party, the designated Democratic Party's database containing the hard drive had gone missing from the Pima County vault. It was only upon Bill Risner's visit to the County Clerk's office that the box of hard drives reappeared: in the hands of John Moffat, who had only a garbled explanation for why he was illegally in possession of the hard drives. Goddard replied: "Well I meant that's part of what I'm talking about. I was aware that that had happened...those are part of the very disturbing combination of events which ultimately said let's not depend upon as we did initially in our first past to review the electronic records." 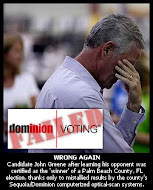 If he didn't believe there was cause to examine the ballots for their authenticity then, there is definitely cause now. This investigation is incomplete. Probably the most disturbing aspect of the missing poll tapes is the blow to the already poor confidence in the Pima County Elections Division. Despite efforts to improve procedures, issue self published report cards and oversee a hand-picked Election Integrity Commission, nothing can distract the public from the fact that the same people are operating within the elections division with impunity. Now we have a recent mayoral election in Oro Valley sporting very peculiar numbers. For this Oro Valley race, vote by mail consisted of 66.68 percent of the total vote. Within the 66.68 percent of the mail-in votes, Mike Zinkin was ahead by approximately 53 percent to Satish Hiremath's 47 percent. Within the remaining 33.32 percent of the votes, Hiremath was in the lead by 55.87 percent to Zinkin's 43.77 percent. This makes the spread between vote-by-mail and all the rest of the votes as large as 9 percent. A spread that has never been seen before in Pima County's election history. With this difference, Hiremath won the Oro Valley Mayoral race.